Despite all the treaties, pledges, export bans and labelling schemes, the world’s forests are still disappearing at an alarming rate. In poorer countries a forest may simply be worth less as a living, thriving ecosystem than it is as timber and farmland. So if money is a key factor, why not get rich countries to pay poor countries to stop chopping trees? The UN Climate Summit in New York saw major new agreements along these lines. 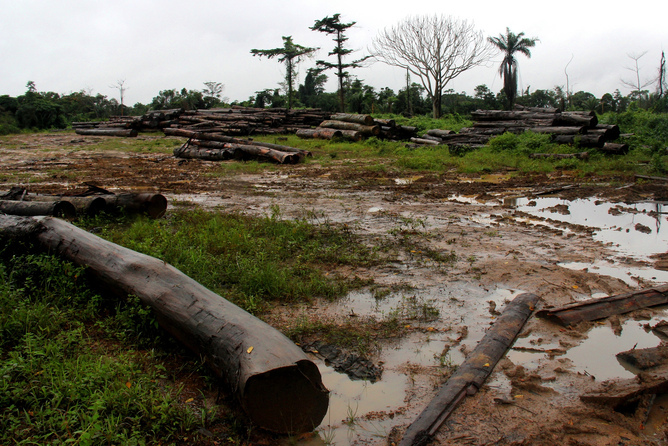 Norway in particular has pledged to pay Peru and Liberia hundreds of millions of dollars if they protect their forests more effectively. Such so-called REDD+ schemes hope to save millions of tons of carbon emissions while at the same time protecting indigenous people’s rights. Although these bilateral deals sound good in principle, many NGOs, indigenous people and community groups have expressed significant concerns. The deal with Peru, which also involves Germany, is designed to cut the rate of deforestation in that country, home to large expanses of the Amazon rainforest, by paying its government up to US$300m if certain targets are achieved. A similar deal with Liberia is worth up to US$150m. Norway, Germany and the UK have promised further REDD+ funds if developing countries come forward with credible proposals. Such bilateral agreements are not new, and Norway in particular has signed similar deals with Indonesia, Brazil, Guyana and other countries in recent years. These latest announcements are part of a wider New York Declaration on Forests, which involves more than 150 governments, companies, indigenous peoples organisations and NGOs, committing to halve deforestation by 2020 and end it by 2030. But the destruction of the world’s forests continues apace, and we are still far away from a truly global agreement. Every single country on earth would benefit from global forest protection, given forests’ importance for biodiversity and their ability to store carbon. But despite efforts ever since the Rio Earth Summit in 1992, it has been impossible to reach a global deal. Given this deadlock, bilateral agreements may be the best alternative. As early as 2006, the Stern Review argued that curbing deforestation was one of the most cost-effective ways to reduce emissions. Indeed, the review recommended precisely the Norwegian approach of compensating countries for the opportunity cost of other forest uses and the cost of managing the resource. Money talks in cash-strapped developing countries. By putting a price on trees that remain standing, such deals potentially introduce a viable alternative to logging or burning. Yet, a range of NGOs, pressure groups, indigenous people organisations and other civil society groups have expressed deep concerns over such schemes. First, are US$300m and US$150m, as in the Peru and Liberia deals respectively, enough to change decisions and development paths for the long term? The underlying problems generating deforestation are complex and require multiple approaches to correct, including changes in buying behaviours of companies and consumers in the industrialised world. Indeed, deals have been struck with Liberia and other countries before, but deforestation has continued and hence their results have been mixed. Some have claimed that changes to deforestation rates have generally followed trends begun before the Norwegian interventions and have been driven by other indigenous changes in attitudes, laws, and enforcement. So, deals with Norway alone will not be enough. Political will and leadership in developing countries, and being able to confront economic elites, are essential to address the drivers of the problem. A second concern is that not all forests are alike, and some are more worth saving than others. A forest plantation should be seen more like an industrial, monocultural crop, with much reduced biodiversity and even increased carbon emission rates, given the uses of fertilisers and pesticides. Such plantations are quite different from untouched Amazon rainforests, for instance, and raise the question of which forests are actually protected by these agreements or should be. Third, how the agreements are implemented and who receives the payments has important equity implications. Experiences so far suggest that it is often elites in the receiving countries that benefit the most, further exacerbating social and economic inequalities. If the environmental problem of deforestation is more clearly understood as social and economic problem, so that wide disbursement of the benefits is necessary to achieving a solution, then the promised US$300m and US$150m deals suddenly seem very modest in comparison to the scale of the problem. Fourth, and perhaps most importantly, it is often forgotten that forests are the homes of millions of indigenous people around the world. The new deals with Peru and Liberia explicitly acknowledge this, which is a step in the right direction. Yet, serious concerns have been raised by AIDESEP, the main organisation for the indigenous peoples of the Peruvian Amazon, and Rainforest Foundation Norway. These groups point to conflicts of interests and double standards at the centre of the Peruvian government, which has presided over a decline in the protection of forests and indigenous rights in recent years. Hence, the general principle of protection in the letter of intent may not contain enough teeth to be effective. That being said, such deals could be a step in the right direction if the money encourages some of the underlying conditions for better future forest management to take hold, including better mapping and associated enforcement mechanisms, better training and staffing of those in forest management and increasing awareness of standing forests as assets as well as cultural home to indigenous people. The latest agreements specify some reasonable steps toward the ultimate goal of stopping deforestation by 2030, and to “cut emissions and reduce poverty at the same time,” in the words of one Norwegian government adviser. But actually reaching that goal might be a big ask from such bilateral agreements alone, given the complexity of the problems involved.